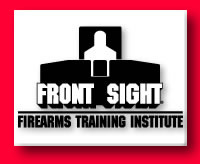 Front Sight Firearms Training Institute Offers the Ultimate in Armed and Unarmed Self Defense. ntentionally incompetent. That's how Ignatius Piazza describes people who have the potential to defend themselves but don't learn how to do it the right way because they're lazy or afraid of being criticized. Graveyards are filled with their kind, he says. Unconsciously incompetent is the term he uses to describe people who are in pretty much the same boat but a little less guilty: They don't know that they don't know how to defend themselves. Together, the Americans who fall into these two categories make up more than 95 percent of the population. Since they've never been in a fight, they have no idea how poorly they will fare. Until it's too late. Before you get your gi bottom in a bunch, know that the mere act of enrolling in a self-defense class or reading a magazine dedicated to the subject places you above those two groups, for you have taken voluntary action to preserve the safety of yourself and your family. Welcome to the upper echelons of Piazza's world of selfdefense: the consciously incompetent (students who know they need to build their skills and diligently seek to do so), the consciously competent (practitioners whose bodies and minds function efficiently under pressure) and the unconsciously competent (masters who act instinctively in the face of danger). Heightened awareness of your body, your opponents and the environment. 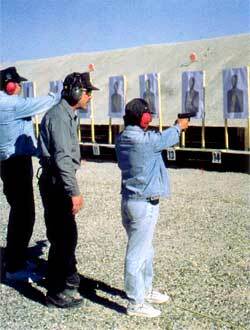 Front Sight's handgun training takes place at distances as close as three yards and as far away as 25. When making those statements, Piazza, founder and director of Front Sight Firearms Raining Institute in Front Sight, Nevada, was actually referring to America's 65 million gun owners, but his points apply just as succinctly to anyone interested in self-defense. That's why he founded his school in Bakersfield, California, in 1996. To help more civilians learn how to use deadly force responsibly, the following year he purchased the real estate that would become his expanded Nevada base of operations. Now he's forging ahead with his plan to offer the public intensive training in contact weapons (knife and stick) and empty-hand defense. Piazza's current facility sits on a 550-acre chunk of land located some 30 minutes from Pahrump, Nevada, and one hour from Las Vegas. A freshly paved 4-mile-long driveway leads to a compound that's a virtual paradise for students of self-defense. Want to learn how to safely and effectively fire a handgun, rifle or shotgun? Front Sight has 15 operational ranges and 400 yards of underground training tunnels. Want to learn knife fighting or grappling? Front Sight has a 5,400 square-foot martial arts gymnasium. Want to learn how to tactically descend a rope like a SWAT officer? Front Sight has a five-story, world-class rappelling tower. 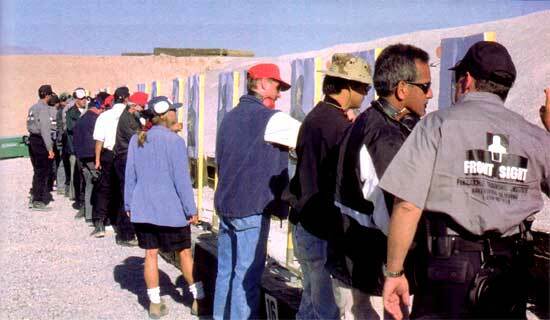 The four-day defensive-handgun course culminates in a friendly speed and accuracy competition. After having built a reputation as one of the United States' premier firearms-training facilities, why is Front Sight sinking millions into ancillary aspects of self-defense? Because Piazza, a 42-year-old retired chiropractor from Santa Cruz, California, is a firm believer in the individual's right to preserve his own life, and with that right comes a responsibility to rise above the intentionally incompetent and the unconsciously incompetent in all phases of fighting back. The older we get, the more necessary it becomes to level the disparity of force between us and a younger, bigger, stronger, faster opponent. Your natural weapons should be your first line of defense when deadly force is unnecessary or when you are ambushed and need time to deploy deadly-force weapons. But when your life is on the line, a firearm may be the only thing that will equal the odds. To better meet the needs of students, on September 1, 2002 he launched a new program called Family Safe Forever. Aimed at the spouses and children of Front Sight's primarily adult-male clientele, it is composed of courses on child safety, mental awareness, pepper spray, edged weapons, empty-hand self-defense and fear management. The curriculum was developed by martial arts masters who combined the street-proven techniques of numerous disciplines into a coherent and comprehensive program, Piazza says. Students check their targets after a session of close-range defensive firing. Most Front Sight students agree. "There's a great need for women in this country to learn all aspects of self-defense," says Donna Glidewell, a Victor, Montana, resident who recently attended Front Sight's four-day defensive-handgun course. "I trained in hapkido for about five years. I'm here now because I decided I wanted to learn how to use a gun safely-for times when the size and weight of a man are too much to overcome." But for occasions when you're unarmed, Piazza says, it is essential to possess skill in emptyhand fighting and contact weapons. "Obviously you will not always have a gun with you, but you will always have your hands and feet," says Gary Hibbard, a part-time Front Sight shooting instructor who also owns a tang soo do school in Dover, Arkansas. "You have to be prepared for anything." At Front Sight, being prepared for anything means learning the proper skills from a qualified instructor, then practicing them regularly so they don't atrophy. "In a real fight, you will be only half as good as you were on your best training day," Piazza says, noting the effects of stress and adrenaline. "Therefore, you have to train twice as much as you thought you had to." 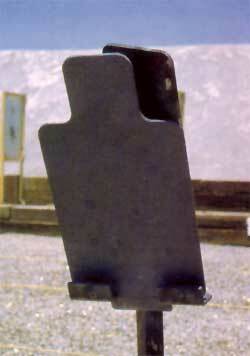 A target designed to simulate a criminal shielding himself with a hostage enables students to hone their sharpshooting skills. No Gun Nuts Need-or Can Afford to-Apply! The Front Sight student body includes doctors, housewives, truck drivers, journalists, lawyers and pilots (who train for free post-9/11). Gun-toting rednecks and government-haters simply can't afford the fees, which range from $600 for a two-day seminar to $1,600 for a fourday course. Ask the designers of any planned community about the best way to keep out the riffraff, and they will tell you that high prices are a better barrier than high walls. Still, Front Sight's prices are not artificially high, Ignatius Piazza says. "They reflect the value of the facilities, the curriculum and the personal attention provided." The more training you get, the less likely you are to have to use your skills because you'll possess the awareness needed to avoid trouble and you'll be confident in your physical abilities, he continues. "You will learn to swallow your pride and let the little things go by." It's a concept every martial artist knows well. Upcoming development at Front Sight, which now trains up to 50 0 people per weekend, includes a martial arts gym that will expand to 12,000 square feet. Six additional firing ranges and a state-of-the-art evasive-driving course are scheduled to open later this year. If Ignatius Piazza's track record in the firearms-training community is any indication, Front Sight may soon become the 800-pound gorilla of the realityfighting and personal-security world. About the author: Robert W. Young is the executive editor of BIack Belt. For more information about Front Sight, call (800) 987-7719 or visit http://www.frontsight.com.